Good Morning. I think Mike and I have pre delivery jitters! We have been anxious and abit hyper the last few days. The final stretch is approaching. Just a few more days of anxiety and prepping for our new arrival. We are patiently waiting. Neither of my births were scheduled. I had both my children natural, without any epidurals. For some odd reason, I thought that was organic and healthier for the baby. Things were different 30 years ago. I had ultra sounds and weekly visits. I had high risk diabetic pregnancies. I remained healthy and glucose controlled. I lost weight and thankfully, my children had no side effects from my diabetes. My children were induced, both times. My daughter was 2 weeks overdue. When my OB asked how many “weeks” I was at a weekly check up, I mumbled 52. She listened and decided to do the induction the next day. Joanna is resting, nesting, and feeling very pregnant. She can’t sleep much at all. The baby is moving all night, she told me yesterday, she is ready. I suppose we all are “ready”. As ready as one can be. The anticipation and anxiety are high. The days drag on, and time stands still…while we wait. I have tons of nervous energy. This morning we awoke @4am. That is just plain silly. The extra early awakening allows me to make more detailed lists and projects to accomplish. I thank God for my energy and stamina. The one amazing perk about losing weight and quitting smoking is you have a ton of energy. What I celebrate is not being winded or out of breath or tired, sleepy, lethargic, and no more extreme joint pain. I can run up stairs like a kid. It’s crazy, yet I am privately celebrating these moments. I have been going 110 mph, for days, I admit it. I need a way to burn off all this anxiety and worry and excitement. For those who know me, well Shopping is my #1 go to…I’ve done enough of THAT the last 12 months, just saying. So I clean and decorate and organize. Yesterday was nearly 50 degrees again, so Mike and I did some yard work. We haven’t had any shhhhhh snow yet, so we cleaned out flower beds and raked and organized some more. It was good, fresh air, sunny, nice. It’s nice to have a few days off to catch up and organize and catch up on stuff. I was hoping to post the pics of the baby nursery. I’m sure all the wives reading today, know this & can relate. The new to be Grandpa, well, he is a procrastinator! he waits to the last minute to paint and finish things, and it drives me NUTS! I did not ask or nag, I simply waited, and waited and huffed and puffed and mumbled how HIDEOUS the walls look all scuffed up and the room needs a good “scrubbing” from top to bottom before any BABY sleeps in there. (It worked smirk)…& he loves to “scrub” for special occasions! He should finish the painting today and the room should be ready. I promise to share some pics of the little nursery with you…(yeah, I sound repetitive). How do people function at the 11th hour? I am so not about that. As I get older, I crave organization and order. De Clutter is my new Mantra….(whaaaaat)?? Sounds ironic for a mini hoarder/collector huh? Good times. LOL. I did finish some cute accent furniture for Anna Lisa’s nursery. I really enjoyed refinishing and decorating, its quite therapeutic. This baby will always have a special room at Nana’s <3. So we are at the final stretch 4 days and counting! I will certainly keep you posted and appropriately Brag like a good Grandma should :). So I sit and write to you, and sip my hot coffee and ponder what to do next! I’ve been up for hours already and I must stop myself from dismantling the Christmas décor! It’s not even New Years, I think I should wait a few days. Part of me is saying. You know how clean and organized it looks after you put away the 20 boxes of Christmas stuff! It’s that ridiculous OCD organizational voice again. RELAX LeeLee! Geez….. I know. Good Morning to you. I hope this blog post finds you well rested and content. I strive not to over stress or develop anxiety over a simple holiday. 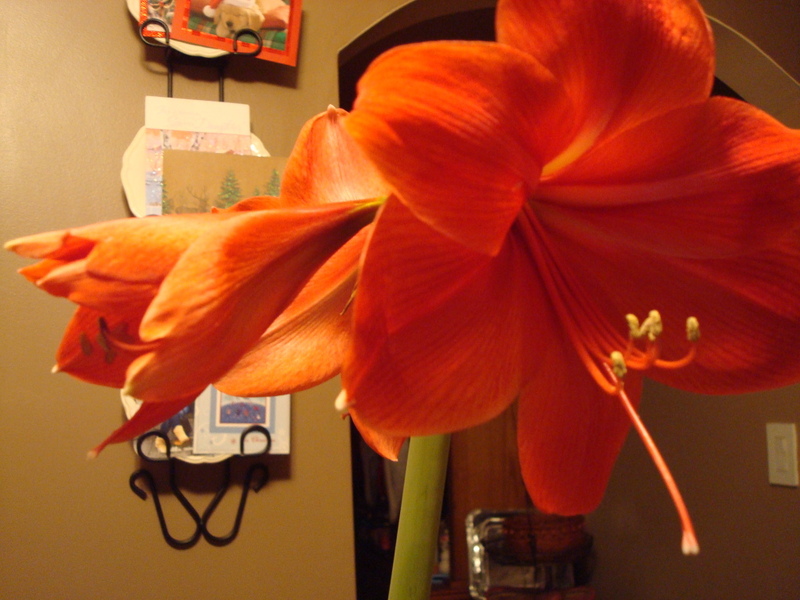 Christmas has meaning, deep seeded from my Mother and her love for it. I have shared here before, that the last few years have been a slow and steady progression of grieving and healing. I could barely muster up any heart or desire to “celebrate” our Lord Jesus. Part of me was angry, part of me so sad. I remember the first Christmas Eve, I didn’t host. My mom had passed October, the holidays crashed down so fast, it is still a blur. What was clear in my heart was, both my parents were deceased. I truly felt orphaned for the first time in my entire existence. I yearned for a stand in maternal figure. I allowed myself to grieve. I went to my brother’s for dinner and it was simple and easy. I knew it was ok not to feel good. It was quite normal to feel numb to it all. You definitely go thru the motions, I also knew, the day would not last forever. I had grown accustomed to Christmases without your loved ones. After my father died, missing them around your table, reminiscing about them, sort of became a tradition. I desperately tried to keep them alive , I spoke about them so my children would remember them easily. I wanted their memories and traditions , to remain intact. I know I wanted to preserve those moments forever. The truth is, those memories from our childhood and early adulthood are no longer apart of our Christmas. Slowly, we learned to adapt and adjust to change. My brother doesn’t speak much about our parents. He doesn’t stand and make a big speech or say a blessing or a prayer before dinner. He doesn’t read a Christmas letter to his children or wife. He doesn’t carry any of those traditions my parents began . My oldest brother Thomas, opens his home and his heart to everyone to come and enjoy, relax and have a beautiful meal with his family. He has a beautiful Granddaughter, who is 3 now. She has been our light and hope each and every year since her birth. She is our families future. As you well know, this Year is a very special one. My Granddaughter, will arrive on New Years Eve. This Christmas will be different. Our lives will be enriched and forever changed. I have dreamt about this, about her, about my children having their own… My entire life. Here she comes <3. My heart is beating faster as I type. My excitement is stirring. Our little angel Anna Lisa is ready to be born. Praise Jesus, may she be healthy and loved and blessed every day of her life. I daydream about this baby, I can’t wait to meet, and hold and love eternally. Mostly, I think of my Mom. How I wish you were next to me to share this together. Please watch over us and pray for them. Christmas miracles and countdown continues! It’s beginning to feel a lot like Christmas! Indeed it is, and I am seriously seeking a small useful Elf type person to get me ready! I love this time of year, for the last decade or so, the term Merry was hard to fathom. I mean, I love being with my family, and sharing a good meal and presents, but I was grieving and trying to heal from the devastation of losing both my parents. I’ve said this before….my Mother, was “Christmas” in every sense of the word. She prepared for weeks, her décor was over the top Italian, but we loved it. Our Christmas Eve Fish feast was quite the production too. I now know, what I miss the most, is her. Her in her slippers scuffling up the stairs with platters and trays and over stuffed bowls of her delicious cuisine. She baked for months, all Daddy’s favorites, and her Grandmother’s desserts. All from scratch. She didn’t have a “kitchen aide” for 50 years, she hand mixed her dough. I remember her making 25 lbs of sweet butter cookies. I swear my siblings & I lived on Butter Cookies for a month! She would start early in the morning and create and prepare till late in the evening. She did it for US, she did it for tradition, purely out of love. Her happiness was to only see us smile, and love each other and most of all that we ALL be together. That is what I miss, and continue to deal with each year. The miracle in all of it is, my children remember every moment of our Christmas Eve’s and desperately want to keep the traditions and family together. They miss their Grandparents, and we all feel the loss each holiday season. For many years, the light was dim. It was dark and painful without them next to us. The last 5 years, I wept to my Mom, how could I manage without her? How can I find the light, her Christmas again? 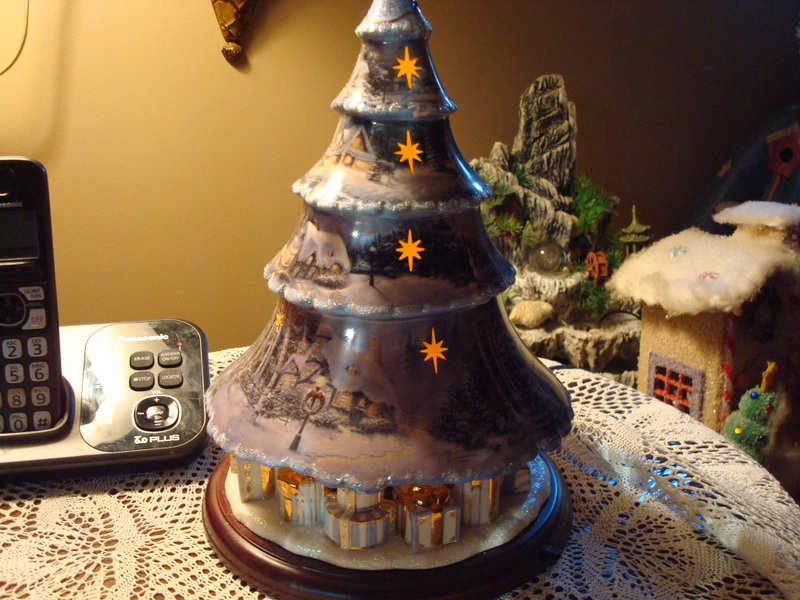 One year, my mother gave me a Thomas Kinkade porcelain lighted Christmas tree. It was exquisite and detailed. It revolves and is lit within, with cut out stars that reflect all over the room. The painter of Light he was noted for…my Mother was my light and I hers, especially in our darkest moments. It is so beautiful and I love his work, I was truly touched. It symbolized so much for us, her deep love of family & Christmas trees! I cherish it, and think of her every time I look at it. I feel her spirit and love around me lately. Guiding me again, comforting me in her gentle ways. I need her kindness and support now, and wish my parents could be here, next to me. The other day, I was browsing at a consignment shop. 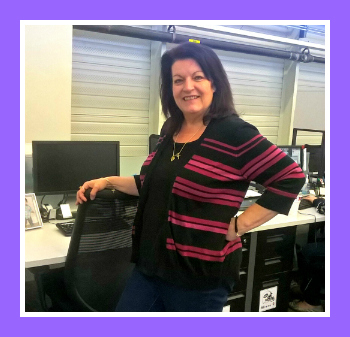 Over the past year I have donated a thousand items of larger sized clothing, it feels liberating, but I also need lots of new clothing (boo hoo nawt really!) so I decided to try and consign some of it. I haven’t had much success in re selling them..it is what it is. A few months ago I found a little piece of heaven at this shop. I had just scored a beautiful Victorian bench/Setee for our bedroom. It is something I dreamed of having since I was a child. It’s romantic and royal and vintage…He also has a small art gallery there now and I was browsing thru and I saw a small Kinkade painting I admired. The owner and I were chatting and he was willing to sell me the painting for a very good price. I loved the painting a lot, yet it was a small 5X7 not exactly what I had envisioned, but he piqued my interest for sure! I didn’t buy it, I wanted to think more on it. I’m glad I waited…a miracle was coming but at the time, I didn’t know it. I believe in the ability to channel energies and love from the other side. I have had some incredible experiences with connecting with my parents energy and love. I was out running errands and collecting Snowmen as usual! Ok!!! So, I adopted a few yesterday and the week before, they were cold and homeless and they “spoke” to me! It’s my favorite hobby over the last 10 years or so..it does my soul some good #snowmanobsessed! Back to the miracle! LOL! I was heading back to the consignment shop, they called and asked me to pick up merchandise I had consigned there, they were revamping the store…I was abit sad. I had a ton of new clothing I was hoping to sell, so I can in turn, buy more clothes! I was feeling defeated, and had not sold anything to date there, I was ready to cash in and donate it to someone who could really use it. I walk in and see the owner Charles is there, the consignment/thrift shop is new to the Smithtown area, & he relocated there a couple of months ago. He is a gentle soul, with a good eye for art and collecting and has some interesting vintage/ antique furniture going on. I told him, I was feeling sad, that his employee called me to come collect my merchandise and I had just dropped off a large amount of new clothing last week too! I was feeling “meh”…bummed. He said, you don’t have to take it back! Just take some older items from 2 months ago, you could leave the rest. I was bummed! I had spent hours getting it all there and nothing sold! I told him, I would rather donate it, I just can’t bring it back home! He said…I feel bad, how can I make this right for you? 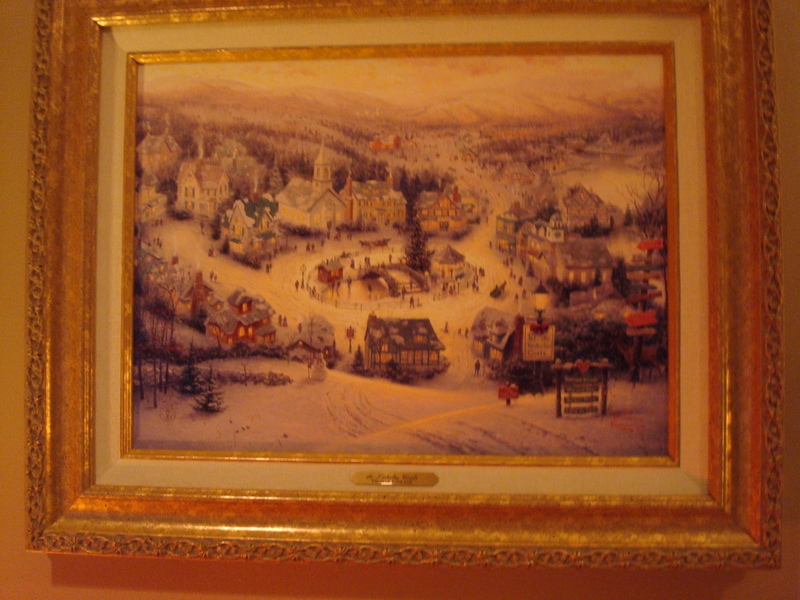 I glance down at the floor and there sits a Thomas Kinkade a fabulous piece, a winter wonderland scene, large 16×20 painting, framed in gold. (Adrenaline Rises People)! I smile and we laugh abit, I said, hmmm well this one is Lovely! and he said…I saw you pull in, I thought you might like it! Here’s the happy ending. He pulls a shopping cart with all my merchandise piled high. It would fill up my entire car if I schlep that stuff back home! & My hubby will Kill Me! I’m thinking…brain is processing…oh boy… So I coyly suggest….How about we trade! You keep ALL my merchandise (Over $500 +easy in new retail clothing) plus all kinds of other goodies, and I keep a few pieces of clothes and the painting. He haggles for a few bucks on some other clothing I found and he smiles and agrees, noting, you really DO love to negotiate. Umm hell to the YES…Charles, I certainly do. The next few hours is a blur frankly, I was in la la land, at Lowes, (God, I loathe LOWES on a Saturday!) and I arrive home safely and anxiously await the moment when I hang her…my Kinkade, my miracle & dream. I know my Mom is watching and smiling. #christmasmiracles. <3. Here is a peek at my prize, and the beautiful Kinkade Christmas Tree my mother gave me Enjoy & blessings to you & yours ~ leelee. Good Morning from cloudy New York. I haven’t seen a flake of snow yet…. Long Island had lots of rain yesterday and today’s forecast is abit chilly at a high of maybe 40. The week ahead shows up in the 50’s, so hey, I’m not complaining here. It is time to decorate and get festive for Christmas and more importantly!!!! (drum roll please!) The countdown has officially begun! Our Granddaughter will arrive on New Years Eve! via C section. It is exciting to know we will meet her in 3 weeks. I pray the delivery and baby arrive safely and most of all healthy. They are busy getting there nursery ready and in order for Anna Lisa. I am trying to be patient and calm till our little one makes her debut! I finally got my new camera up and running, I can’t wait to play with it and be able to share some beautiful pictures and moments with you. I am going to start the holiday baking frenzy. I have a dozen or so delicious cookie recipes I make every year. My daughter is kind enough to help her Mama, and we do it for several weeks and fill dozens of tins and containers of cookies. I give tins as gifts and also bring a dessert platter to my brother’s for Christmas Eve dinner. It’s a tradition we share, and my husband has quite the sweet tooth himself! I took advantage of online shopping again this year. I must say, it wasn’t very stressful and I got most of what I wanted. I hunt for free shipping or a good coupon codes and they deliver right to my door. It’s a good thing, and it saves me lots of time. A win, win hands down.